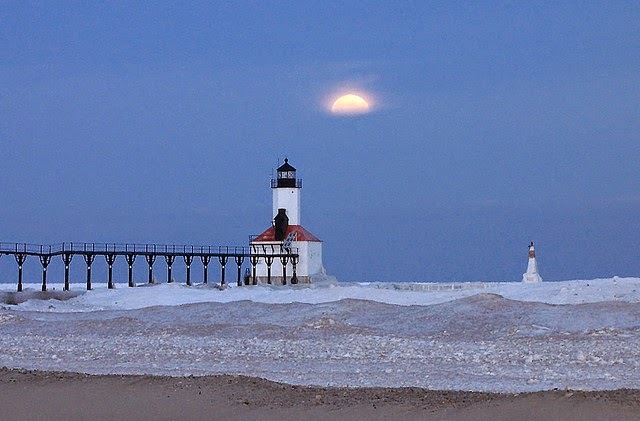 hearth/myth: Seasons: Winter in Michiana. Julia glanced out the window. It was snowing so hard now that she couldn’t see the trees at the back of her property. She went to another window, trying and failing to see the Stareks’ house across the street. She thought maybe she could see a glimmer from Ms. Thea and Ms. Elsie’s through the murk, and wondered how the ladies were getting on. Then she thought of Dave – although really, she hadn’t stopped thinking about him since running into him at the store. She picked up her phone and texted him: You OK? I've lived here in DC so long that sometimes I wonder what it would be like to live again in a place where it snows. Oh, DC gets snow. Sometimes we get a pretty good-sized snowfall. Some years, we even get a lot of snow. But those winters are a far cry from the winters of my childhood. The school bus would pick up the kids in my neighborhood and then take Lake Shore Drive west, through Duneland Beach and Long Beach. Through the bus window, we got to see Lake Michigan in all of its moods: calm, with few waves; stormy, with high surf; and frozen. And we almost always went to school, regardless of the weather. Here in the mid-Atlantic, if there's a couple of inches of snow in the forecast, the powers-that-be will give the kids a day off -- even if the snow hasn't started falling yet. It's faintly ludicrous. I mean, I get that part of the problem is logistical. a lot of kids have both parents working these days, and if school is going to be canceled, the parents need to know in time to arrange for somebody to stay home with them. But the other issue is that DC doesn't know how to handle an honest-to-goodness snowfall. Instead of sending the plows out as the storm is underway -- which is what happens north of here -- the highway departments around DC will wait 'til the storm is over, and only then begin digging us out. To be fair, where I grew up, we got a lot more practice -- particularly on our side of the lake, where we would often be treated to the winter phenomenon known as lake-effect snow. Here's how it works: when the wind blows out of the northwest, it picks up moisture as it blows across the lake. The moisture-laden air cools as it moves over the land, the water in the air condenses, and it snows. A lot. Here's a satellite picture of Lake Michigan so you can see how that works in practice. The area circled in blue is Chicago, more or less. See how you can see the ground on that side of the lake? Yeah. Now look where the red circle is. See how it's all white there? That's Michiana. I wrote a lake-effect snowstorm into Seasons of the Fool, just to make the book as authentic as possible. However, I did not include the other fixture of winter life in Indiana: high school basketball. For the uninitiated, basketball is almost as big a deal in Indiana as high school football is in Texas. For many, many years, Michigan City had just one high school -- Elston Senior High -- and the whole town would get behind the team every winter and cheer them on to victory. 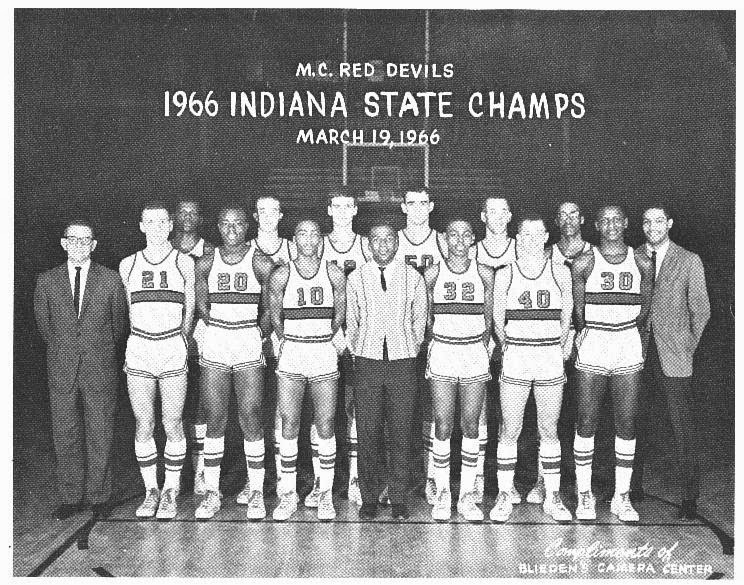 We even won the state championship in 1966. I was in third grade that year, and I still remember the signs at my elementary school in support of our Elston Red Devils. By the time I got to high school, we had a second school in town: Rogers, whose mascot was the Raiders. (I wanted them to be the Rogers Ramjets, but nobody ever listens to me.) Unfortunately, splitting the student population also split our roundball talent. Elston still routinely won sectionals -- our longest streak was 24 years in a row, from 1952 to 1975 -- but we'd often get knocked out at regionals by one of the South Bend teams. However, in 1975 -- my senior year of high school -- Elston made it all the way to semi-state before losing to Lebanon. We were devastated, of course. But I got over it the following year, when I was a freshman at Indiana University. The Hoosiers brought home the NCAA championship in 1976. Like I said, basketball is a big deal in Indiana. Back to the present day. I had a great time this weekend at the World Fantasy Convention here in DC. I met lots of cool people, did a reading for the new book, and came home with a bulging satchel of brand-new books. Rest assured that a number of them will be Rursdays eventually. Next Saturday, I'll be gallivanting again -- this time to New York City for the Self-Publishing Book Expo. As you know, Seasons of the Fool is up for nomination at Kindle Scout through Wednesday, Nov. 26th. And as a thank-you to you guys for putting up with me this month, I'm running a contest to give away a Kindle HD6. If you win, I'll even let you pick the color. The entry form is below; if it doesn't work for you, try using a different browser than Internet Explorer. Good luck! And tell your friends! These moments of wintry blogginess have been brought to you, as a public service, by Lynne Cantwell.